I’ve always loved taking photos, even besides food, if it captures people, places or special memories to look fondly upon, and so long as it doesn’t take away from the meaningful fun of the moment. Recently I’ve been reflecting the deeper meaning of ‘living in the moment’ a thought mostly brought on through my email inbox deliveries essentially screaming like the sea witch in the “Little Mermaid” furiously diving into fall foods and home decorating as if it were the fashion rule of not wearing white pants or shoes after Labor Day, and like potential streams of photos, taking away the fun of the moment. With a few just ripened peaches remaining on the counter, I still plan on making peach dumplings and enjoying those final pleasures of the season before rushing off to enjoy the next of which according to me, has just barely officially yet begun, unless you are a department store already decorated for Christmas. Thinking in the broader picture, reflections then take on their own twists and turns, like chiding oneself for the mere audacity of even sighing on the bursting forth with fall inbox deliveries which then ultimately serve as both reminder and inspiration in truth that all people live in their own moments as they desire, just as I am free to savor the same. Dang. It stings to be wrong. Also staring me right in the face is the fact that there are so far no messages sitting in my inbox pressuring me on when I will be writing about the roasted fall vegetables or pumpkin soup. Perhaps I let my own self cause my own self food blogger anxiety. Still, in the end, reflections don’t void out that indeed there can be something special to be found ‘living in the moment’ and so I prepare a special sandwich for my youngest daughter, Alex, and me. I photograph it. We have fun just living in and sharing the moment enjoying a Portabella Mushroom Sandwich, Roasted Garlic & Red Pepper, Provolone, Baby Greens. A delicious alternative to mayonnaise, the roasted garlic and red pepper mixture serves as the spread adding a depth of flavor combined with the sandwich ingredients, any extra may be frozen or used as a dip, on sandwiches, or added into pasta, soups, or salads. Jarred red peppers may also be used. Preheat oven to 350 degrees. On a small baking sheet, toss red peppers with a tablespoon or a bit more olive oil, kosher salt and cracked black pepper. Place peppers in the oven and roast until very soft and blistered in some parts, around 35-40 minutes. 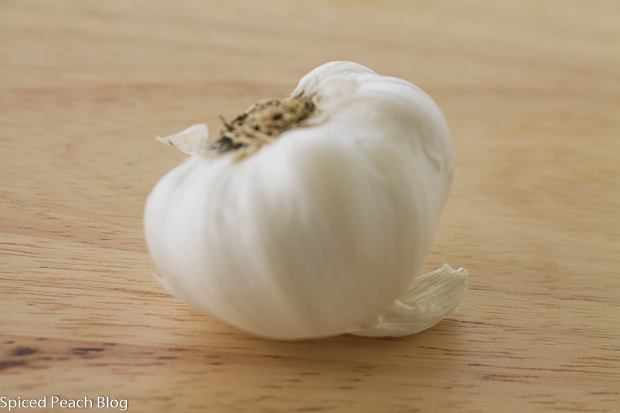 Set the half head of garlic into a very small dish with water, cover with aluminum foil and place on a corner of the baking sheet with the red pepper, remove garlic after 30 minutes, let sit covered until ready to use. 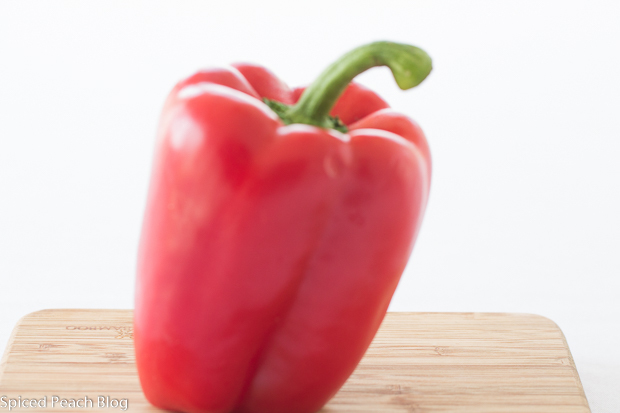 Remove red peppers from the oven, immediately place into a plastic bag, close the bag and let sit around 15-20 minutes until cooled to room temperature. Keep oven on for toasting the sandwich rolls. Slip off the outer skin from the red peppers, pull out the stem, scrape out the seeds, gently run under cool water to remove any hidden, lodged seeds, pat peppers dry then coarse chop before placing into a small food processor. 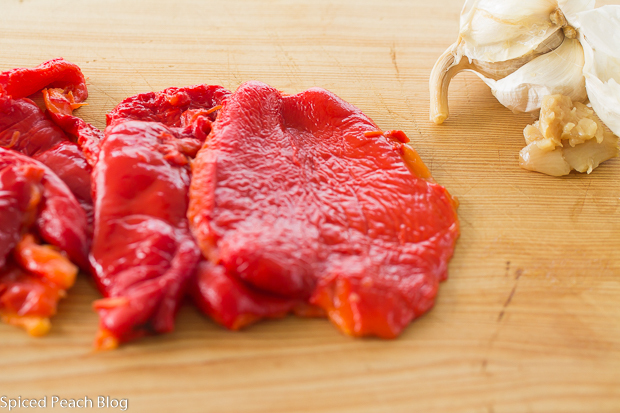 Carefully remove the garlic from the outer papery skins and place into the food processor with the roasted red pepper. Pulse around 5-6 times, sprinkle in the salt, pepper, and red pepper flakes, pulse 2-3 times, drizzle in the white wine vinegar, pulse again a few times until smooth, taste and adjust seasoning if desired, then using a spatula transfer the finished mixture to a small bowl. Heat a saute pan large enough to hold the Portabella Mushrooms on medium high temperature, pour in 2 tablespoons olive oil, tumble in the red onions and cook for around 3-4 minutes until softened and just beginning to brown, sprinkle with a small pinch each salt and pepper, stir, transfer onions to a plate. 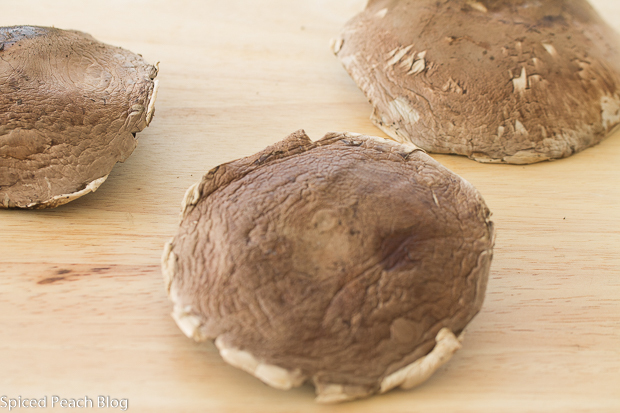 Brush both sides of Portabella mushrooms with olive oil, sprinkle with salt and pepper. Position the Portabella mushrooms in the pan avoiding overcrowding the pan or cook mushrooms in batches. Add in just a bit more olive oil if needed. Cook mushrooms for around 3-4 minutes until softening before turning over and cooking approximately another 3 minutes or so, until cooked through. Toast roll halves on a baking sheet and place in the oven for five minutes, just until hot and a bit crispy, remove rolls. 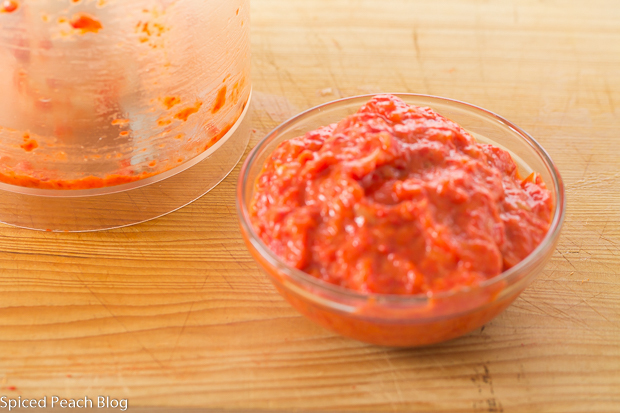 Spread a generous amount of the Roasted Garlic and Red Pepper mixture on the top half. 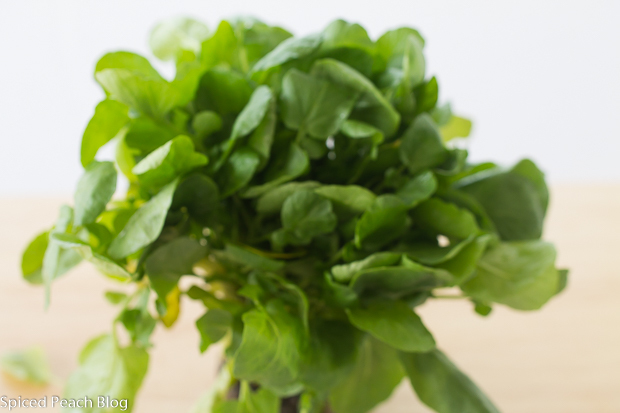 Place 2 mushrooms each sandwich onto the bottom of the roll topping with the onion, cheese, and a small handful each of baby greens, finish by placing on the top of the roll, serve straight away. 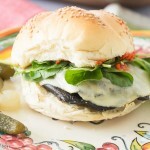 This entry was posted in Sandwiches and tagged Portabella Mushroom Sandwich, Portabella Mushroom Sandwich Roasted Garlic & Red Pepper Provolone Baby Greens, Portabella Mushroom Sandwich Roasted Garlic Red Pepper Provolone, Portabella Mushrooms. Bookmark the permalink. Post a comment or leave a trackback: Trackback URL. Hi Katie, Thank You! 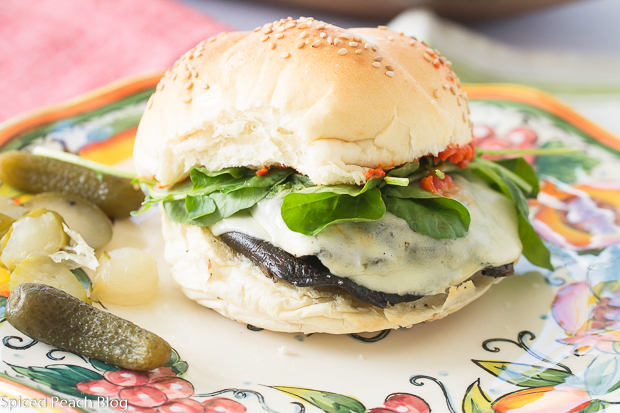 I love the Portabella Mushroom Sandwich, so tasty and a nice blend with the roasted garlic and red pepper, hope you give it a go! Have a terrific weekend and thanks for stopping by! Peg this looks delicious! I’m thinking of making it this weekend except I’ll use a jar of roasted peppers. Thanks much Joanne. The jar works just fine if it is easiest for you, I think you’ll love the combination with the roasted garlic. Enjoy. Thanks for stopping by. Talk to you soon. Beautiful post Peggy, for me living in the moment is sometimes hard to do, not sure why but it is. What a delicious looking sandwich you created for your daughter and yourself, love every component of it. Have a wonderful week-end! Thanks so much Cheri! I think you’ve been doing an awesome job living in the moment this summer and enjoying so much of your experiences and garden delights! I love portabella mushroom sandwiches. They’re meaty enough, but not overpowering like animal protein. Great flavor combination, Peggy. You had me at roasted garlic. Hi Kelly, thanks much! I so agree with you that the flavor of the Portabella is just meaty enough, and so full of flavor! 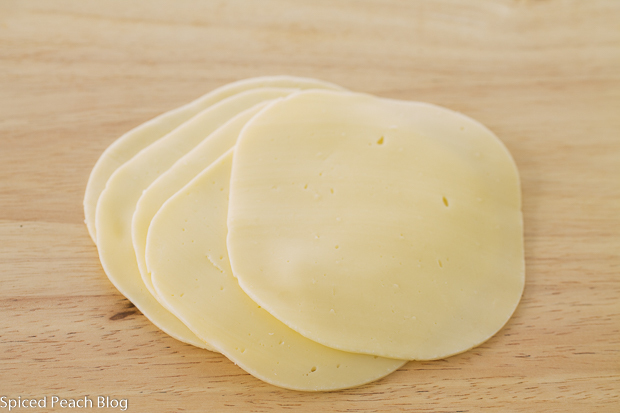 The combination is delish, and easy to prepare the spread in advance. Talk to you soon. Hugs! Hi Remmy! Hope you are doing well. Thanks so much and See you soon, have a great holiday season! Ah Mary, Thanks so much! You absolutely just made my day! Hope you enjoyed it! Saw you have already been in the midst of snow! Hope all is well and that you are enjoying your current adventure. Talk to you soon. Thanks again and Big Hugs to You!